This will install the prerequisite software for the Exchange 2010 Client Access Server. Although the server not always requests to I personally always recommend rebooting the server after installing the prerequisite software. Recently I entered the dreaded -ERR Server Unavailable. 21 error on an Exchange Server. The strange this was that this did not happen to all mailboxes but only to a couple of mailboxes. Nothing written in the eventlog, just –ERR Server Unavailable. 21 immediately after entering my credentials (this error can be seen when using TELNET to access a mailbox using POP3). To get more information regarding the login process you can enable POP logging on the CAS Server. Be very careful with this and only enable it for test purposes. If you forget to turn it off most likely your CAS server will shutdown in a couple of days because the system drive is filled up with POP3 log files. And don’t forget to restart the POP3 service. The POP3 log files are stored in C:\Program Files\Microsoft\Exchange Server\V14\Logging\Pop3. After testing and the Error Server Unavailable. 21 error show up, disable logging (Set-POPSettings –ProtocolLogEnabled:$FALSE), restart the service and open the POP3 log file. Msg=User:joe:bf6c873e-4289-4a64-87bf-2ade894947cd:DAG04-MBX05:MBX19.E14.local; Excpt=""Could not load file or assembly ‘Microsoft.Exchange.Compliance, Version=14.0.0.0, Culture=neutral, PublicKeyToken=31bf3856ad364e35’ or one of its dependencies. The system cannot find the file specified.-FileNotFoundException"""
Restart the POP3 and IMAP4 service and the POP3 Server Unavailable no longer appears. For testing purposes it is useful to know how to use TELNET to access a mailbox using the POP3 or the IMAP4 protocol. Suppose you have a mail server running with POP3 and IMAP4 enabled and you want to give it a try. You are now successfully logged on. If you enter the LIST command all items in the Inbox are shown. RETR 1 will retrieve the first message in this list while DELE 1 will delete this first message. Bottom line is that you are successfully logged on, POP3 is running fine and the mailbox can be accessed. Use the QUIT command to log off from the mailbox. That is: dot space login <<username>> <<password>>, you have to enter the dot and the space before the login command. If you omit either one the login will fail! Again, you have to enter the dot and the space before the actual LIST command. Logoff from an IMAP4 session is a bit peculiar, use the CTRL + ] key combination, followed by the QUIT command (to actually quit the TELNET session). Useful commands for a quick test of your mailbox and the POP3 and IMAP4 services. When using a Lync server infrastructure it is possible to use Lync Phones without connecting them to a PC using the USB cable. Devices like the Polycom CX500, CX3000, Snom UC600 or Aastra 6725ip are just a few examples. Since these clients are not connected to the PC they have to get their configuration information somewhere else. While it is possible to configure these options manually there’s a tool in Lync that will retrieve the appropriate information and configure DHCP for you! 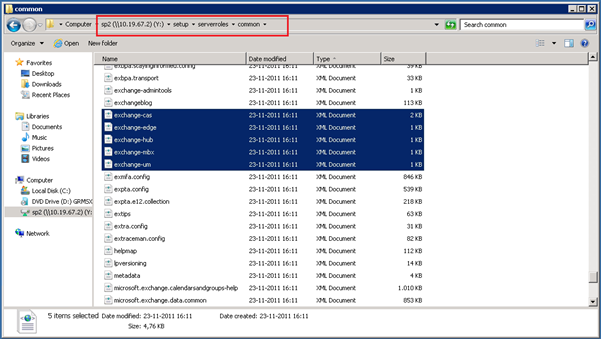 In the past I’ve blogged about building a hosted Exchange 2010 SP2 environment. Basically you have to prepare Active Directory, create a hosting container where all customer containers (also referred to as organizations, not to mess up with an Exchange organization) are located, secure the OU’s etc. Also you have to create Address Lists, Address Book Policies, Offline Address Books (do not forget to secure these to prevent unwanted downloads) and all this in a reliable and consistent manner. There are a number of vendors, each having their own pros and cons but all work according to the same principle using a provisioning engine. This provisioning engine is talking to all services in your environment like Active Directory, Exchange, Lync or Sharepoint. It is also possible to add even more services like CRM, Hyper-V, online backup or Azure.